Anna Hess was born and raised on a small farm in Roane County, WV. 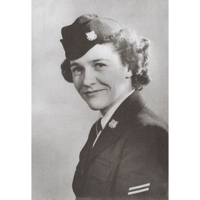 With the outbreak of World War II, her family moved to Akron, OH to work in the factories to support the war effort. Anna’s mother was truly a “Rosie the Riveter” working as a riveter on B29 aircraft wings, and Anna herself eventually went to work in a tire plant during the war. Anna met and married her husband in Akron, and they moved to his hometown of Morgantown in 1948 where they raised their family. In recent years, Anna got involved in the Rosie the Riveter program as a way to honor her mother. The organization in WV is called “Thanks! Plain and Simple,” and as part of the national Rosie the Riveter movement they strive to ensure that the Rosies’ legacy lives on as part of America’s identity and consciousness. Joe Berry Jr. has over 13 years of experience with the company and in that time has held positions of Operations Manager, District Operations Superintendent, Production Manager, Project Manager, Project Engineer, and Electrical Engineer. He has worked for CONSOL Energy Inc. in 7 different states, WV, PA, OH, VA, KY, IN, and IL. Joe Berry Jr. graduated from West Virginia University with a B.S. in Electrical Engineering. He also worked for an Architectural Engineering firm for 3 years as an Electrical Engineer prior to joining CONSOL Energy Inc. Joe has experience in Drilling, Completions, Production, Construction, Pipeline Design and Installation, Electrical, and Communications. Joe has worked with deep shale wells (Marcellus), Coal Bed Methane wells, and shallow oil and gas wells. Pat McCune is Director of State External Affairs for CONSOL Energy. In that capacity, he is responsible for CONSOL’s government, public and community affairs for West Virginia and Ohio. Mr. McCune grew up in Weirton. WV. He is a former Hancock County Commissioner as well as an elected State Senator representing WV’s 1rst Senatorial District. From 1999 through 2010, Mr. McCune ran his own public and government relations firm. McCune & Associates represented the interests of corporations and business trade groups in the trii-state area of West Virginia, Ohio and Pennsylvania. We are excited to introduce Inspire West Virginia to you! We are a brand new nonpartisan organization that helps young leaders improve their communities and strengthen our democracy. We know that there are hundreds of high school students in West Virginia who already have the inspiration needed to keep our state strong and build to an even better future, our goal is to introduce them to each other and help them turn that inspiration into action. Our programming starts this July with our inaugural High School Leadership Academy held at Marshall University from July 15th through July 17th. At the academy, students develop effective leadership skills, learn to build a team, and cultivate the knowledge and abilities needed to be a leader who gets things done in their community.